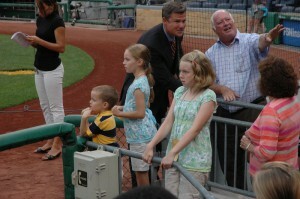 My kids watching, who have no clue that the president and one of the owners are right behind them. Even the parrot removed his hat. 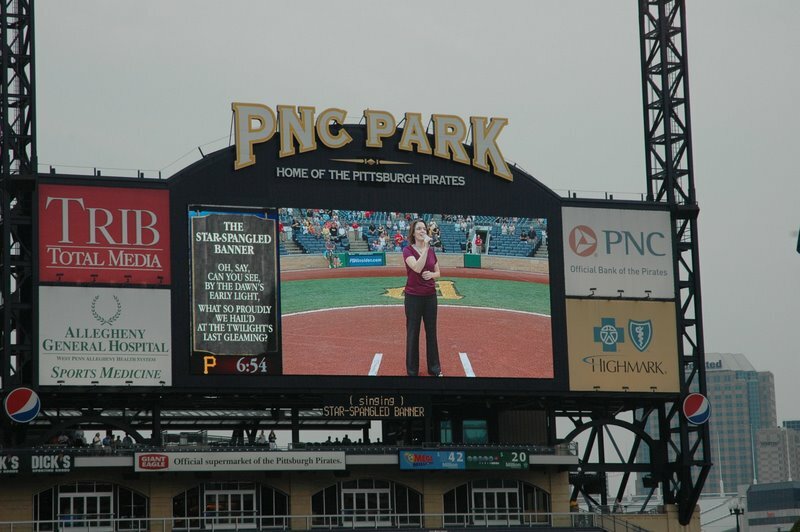 Last Tuesday I got such a fun opportunity – I got to take my family to Pittsburgh so that I could sing the National Anthem for the Pirates/Reds games at PNC Park. What you probably don’t know is that my parents met at the University of Pittsburgh, and my dad grew up outside of Pittsburgh in Mt. Lebanon. 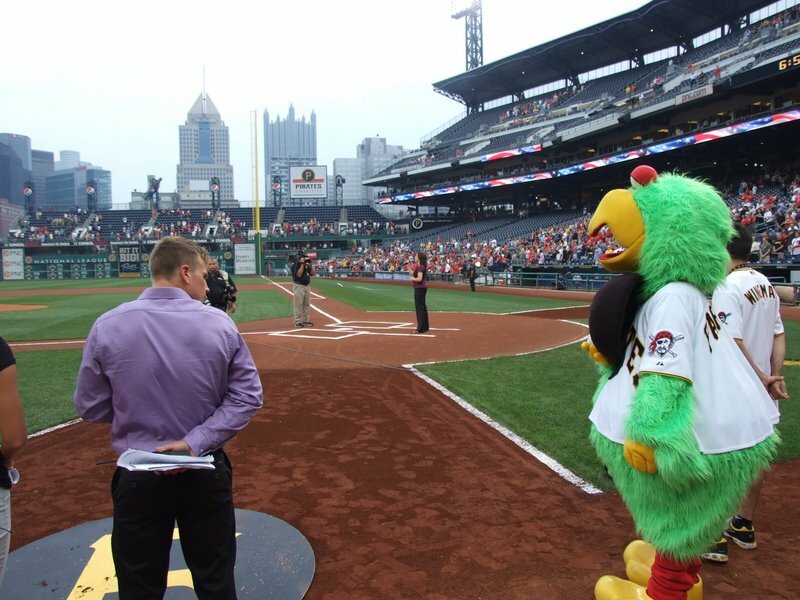 His neighbor and best friend was the son of the former owner of the Pirates, and he spent many, many games watching from the owners box. Pittsburgh sports were huge for my dad – to the point that the stats for the Steelers and the Pirates are an appendix in his book! In my house growing up, not rooting for the Pirates or Steelers was going to get you beaten up by your brothers. So this had a great family connection for me. We got in that afternoon and did a sound check. 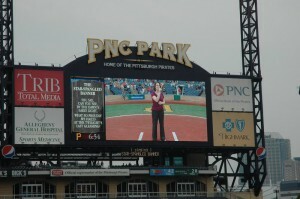 Before the game we all got field passes, and my family got to come down on the field to watch me sing. Afterwards, we met the president of the Pirates, Frank Coonelly, and we had dinner with one of the owners, Robert Brooks. 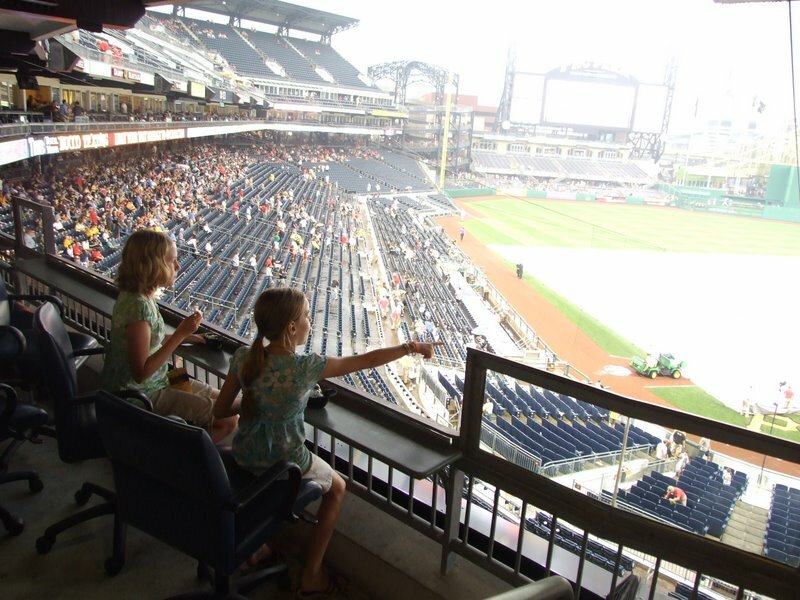 After dinner, Robert and his wife, Sue, gave us a tour of the stadium and we got to see the owner’s box and club – the kids had a fabulous time. 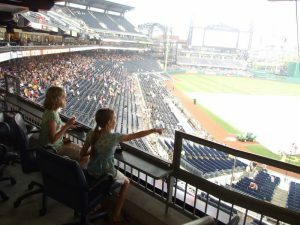 The game was also rain-delayed, so by the time we got back to our seats, we hadn’t even missed much! What a great night. The only problem was missing my dad, and my mom and I were both commenting how much he would have loved being there and seeing that. Miss you, Dad. They’ve asked me back for next year, and I say, hey, take me out to the ballgame! This entry was posted on Thursday, August 5th, 2010 at 10:03 pm	and is filed under News. You can follow any responses to this entry through the RSS 2.0 feed. You can leave a response, or trackback from your own site. Jennifer — looks like an awesome time!. God’s Blessings to you during the upcoming YoungLife concert!! !